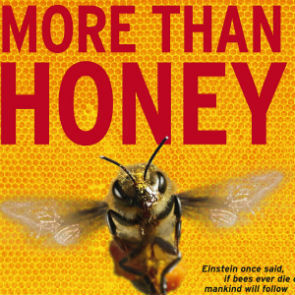 On Thursday 6th June 2013, Film City Glasgow hosted a free screening of Oscar-nominated director Markus Imhoof's 'More Than Honey', a documentary investigating the relationship between mankind and honeybees, and the global population crisis bee colonies now face. Imhoof’s documentary provides a global perspective, focusing not only on the causes of the crisis, but its devastating impacts, and explores some possible solutions. Using state-of-the-art filmmaking to illuminate the world’s bee crisis, this compelling in-depth look at the interaction of humans and bees traverses the globe, from the vast, industrialized almond groves of California, to organic producers in the Swiss alps, from the orchards of China where workers pollinate fruit trees by hand, to Australia, the only country on Earth whose bee population have so far escaped infestation by the deadly varroa mite. Our partnered feature film evening took place to a full house in the Chamber Room. The Glasgow Film Theatre worked with Film City Glasgow in organising the event, which featured information and provided an opportunity to connect with like-minded people and organisations. There were honey-themed post-show snacks provided by Lauckner & Moore and plenty of information about bees and bee-keeping for the audience. The after-show gathering was a great way of engaging the community in conversations about sustainability and our role in modelling more sustainable practices. A number of stall-holders were present, sharing information and enlisting active participation in their community projects.